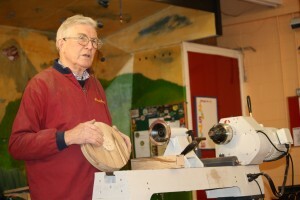 We had a good turnout for our February meeting despite the rugby matches (getting our priorities right) and we were happy to welcome David Sweeney as our guest demonstrator. 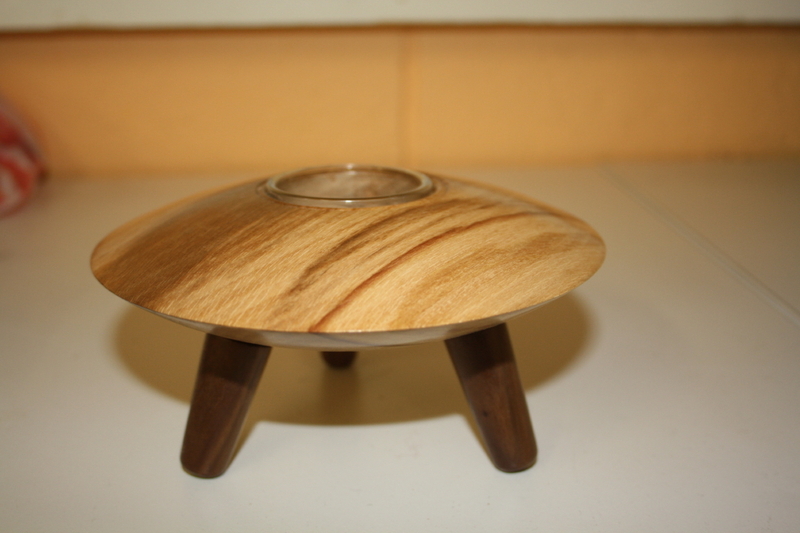 David known to most of we as a skilled turner choose to show us two pieces, the first a tea light holder turned from a circular blank of walnut about 180mm diameter by 60mm deep. 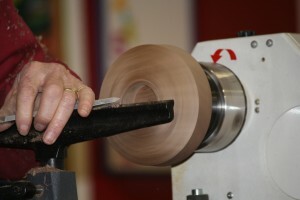 This he mounted on the lathe and started by drilling a hole with a 50mm Fostner bit to the depth of a glass tea light holder which he informed us he had bought in Ikea in a pack of ten, Details can be found here He then proceeded to shape the piece, first on one face, then having turned it over, on the other face until he had a disk as he described himself like a flying saucer, you can see by the photos what I mean. 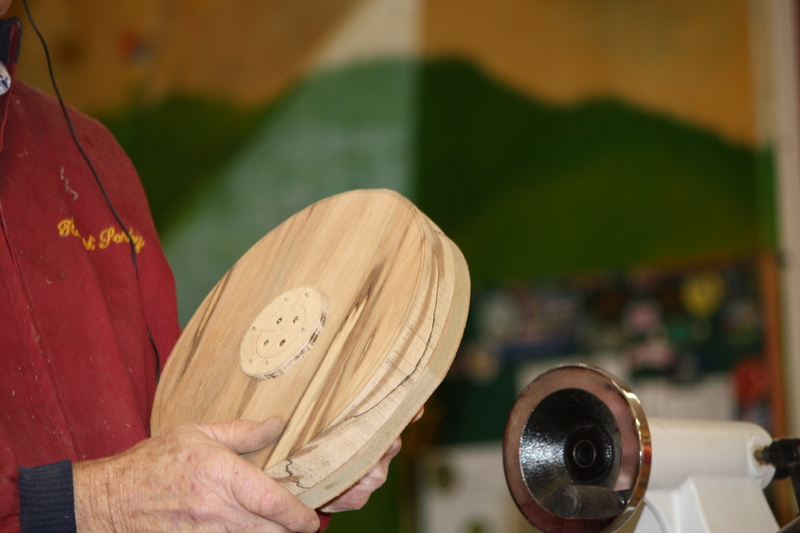 This disk is mounted on three legs, these he turned from a piece of bog yew finishing each one about 75mm long by 15mm at the top tapered to the bottom. At the top of each leg he cut a small tenon to slot into the body of the disk which he then drilled using a jig he had, to get the angles correct. This can be finished with the finish of your choice, we all have our own ideas on this. By the way the tea light holder I have shown in the photos is one David had brought along and is turned in spalted beech. We had our break here with tea and biscuits supplied as usual by our master chef Tom Gibson and then onto the second half of the demo which was a bracket shelf, a very attractive piece turned in spalted beech and ash. 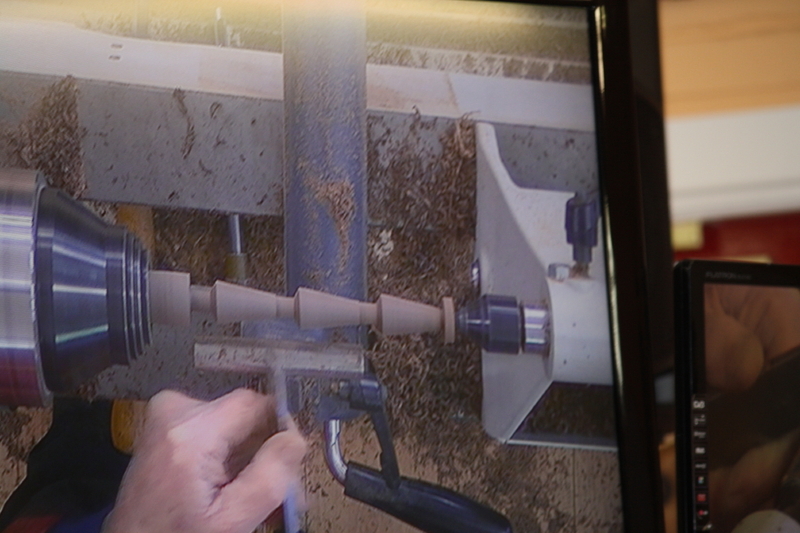 This is one of those split turning jobs where you get two for the price of one, by this I mean you glue two pieces of timber together with paper in between so when the turning is complete you split them and have two half turnings. 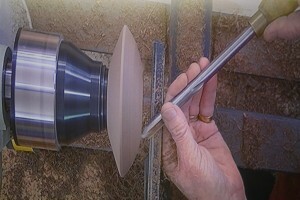 The bracket shelf consists of two pieces of turning, a spindle and the shelf. 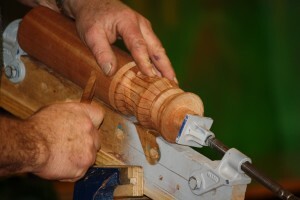 The spindle was turned from a split blank 50mm x 50mm and about 300mm long, you can see from the photos that David screwed a piece of ply to the ends of the blank to ensure the work didn’t split when he was turning it, a wise precaution. Then to the shelf, which was about 225mm in diameter and 30mm thick, again this is jointed as before and mounted on a mdf faceplate. In the centre of this David drilled a hole to the size he had turned the spindle and then tapered the shelf to the outside edge so it didn’t look too heavy. Unfortunately David was unable to complete this piece as time ran out but he did have a finished one to show us and as can be seen from the photo it is a beautiful job. Thank you David. Now to the result of the monthly competition and there were a lot of entries this month, the subject being three napkin rings and first place went to Jim Hynes, second was Tom Murphy and third was Chris Hayes, well done to all who entered. Look forward to seeing you all next month, work safe.